Council members, residents, honored guests, volunteers, staff, friends and family; let me begin by wishing you all a healthy and prosperous New Year. Thank you for joining us this evening at our Township’s annual reorganization meeting. Serving you as Mayor is a tremendous honor, a privilege for which I am continually grateful. Tonight I wish to reassure you the state of the Township is strong, and our future is bright. Mayor Hayes releases 2019 Budget and calls for tax decrease. Please log into our new SDL Portal to view public data including permit information, complaints, violations, licenses & certificates and to place requests for Zoning, Code Enforcement, Fire Prevention and the Tax Assessor. 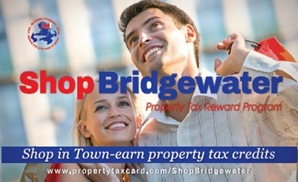 Bridgewater Township officials are proud to introduce a new property tax savings program called the Bridgewater Estate Card which is now available to Bridgewater property owners and renters. The Bridgewater Estate Card is a debit card that offers a reward on purchases that is automatically applied towards one’s property tax. A convenience fee will apply for this transaction: $1 for payment by check and 2.65% of your bill for payment by credit card..
Click here to print or view your tax bill. Over 3,600 Subscribers!! Are you one of them? Simply send us your email address and you will receive a copy of the Township e-newsletter and Bridgewater Email Alerts. By submitting this form, you are granting: Bridgewater Township, NJ, 100 COMMONS WAY, BRIDGEWATER, New Jersey, 08902, United States, http://www.bridgewatenj.gov permission to email you. You may unsubscribe via the link found at the bottom of every email.